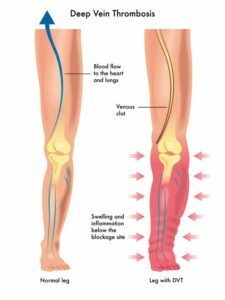 Deep vein thrombosis (DVT) is a serious yet misunderstood condition that affects men and women alike. It occurs when a blood clot forms in at least one of the deep veins in the body, making it a serious health issue that should always be treated immediately. Even if you haven’t been diagnosed with DVT, it’s important to understand the signs and causes of this cardiovascular disease so you can protect yourself from it in the future. Unfortunately, the blood clot that forms from DVT has the potential to cause a pulmonary embolism. A pulmonary embolism triggers obvious symptoms like unexplained shortness of breath, chest pain, rapid pulse, and dizziness. As soon as you experience any of these symptoms, it’s time to seek medical attention. Deep vein thrombosis can be caused by numerous different factors, all of which prevent blood from circulating and clotting normally throughout the body. Certain risk factors make this more likely, including smoking, being overweight, older age, sitting still for long periods of time, and genetics. Blood thinners decrease the blood’s ability to clot inappropriately and minimize the chances of DVT occurring again in the future. Compression stockings can also provide enough pressure on the legs to reduce the chances of blood pooling and clotting in the legs. Minimally invasive vascular procedures can prevent DVT from forming in the future. Visiting your cardiovascular specialist on a regular basis will also help to identify any warning signs of deep vein thrombosis. Cardiovascular Solutions Institute in Bradenton, Florida offers comprehensive cardiovascular care and DVT treatments to help you protect your heart for years to come. Call (941) 747-8789 to make your first appointment today. ← Managing Your High Cholesterol Without Medication: Is It Possible?